Everyone knows that sending emails can be a painful task when you have so many different clients to communicate with, whether you’re sending invoices, planning meetings or sharing weekly newsletters. It can end up being very time consuming and overall decreasing productivity in the workplace. In this blog post I will be showing you 3 different ways that you can send emails directly from your Clinked client portal, eliminating the need to actually use email! 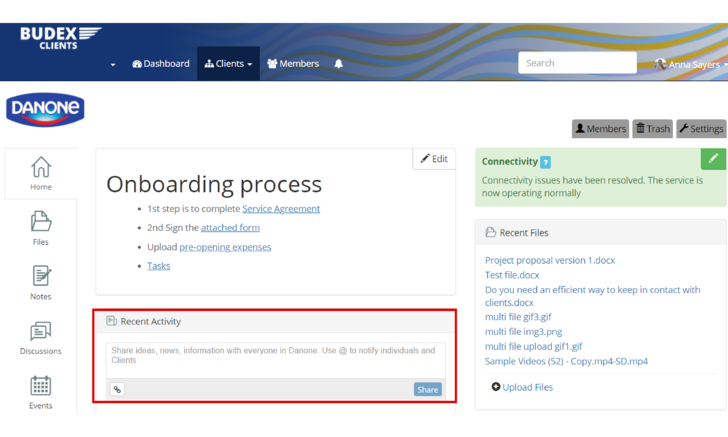 The first method of emailing from your portal I will be going through step by step is using the activity stream, this is where all the recent activity from a specific group within your portal is displayed. However, lots of you probably don’t know that it can also be a handy way of sending quick messages to all members within that group. 1. First you need to scroll down to the Recent Activity section displayed on the homepage of each group. 2. Then type the @ symbol followed by the name of the group you are in. A drop-down menu will come up, select the group in order to tag it. This method can also be used to email only certain members of the group, type the @ symbol followed by their name/s. 3. Finally, type your message and select Share. Group members will all receive the message via email. The next method involves sending emails via the notes function. This method is great because you can create the note and send it to all group members without needing to use any external software, it’s all done directly from your portal. You can insert images, videos, jotforms, links, documents and iframes into notes, so then being able to easily email it to everyone within that group is super convenient. 2. Once you have created your note, scroll down and select Save. At the top menu bar it will then come up with a notification saying You have created a new note, also giving you the option to Notify others. 3. Select the Notify others button, then you will be presented with a box and an automated message with a link to the note you have created. You can personalise the message that users will see. When you select Share it will send an email notification to all members of that group. If you would like to email you group members regarding a note that has been created previously, then you can do this via comments. 1. Open the note that you would like to send to your group. 2. On the comments, type the @ symbol followed by the name of your group. 3. Select the group from the drop-down menu and type a message. 4. 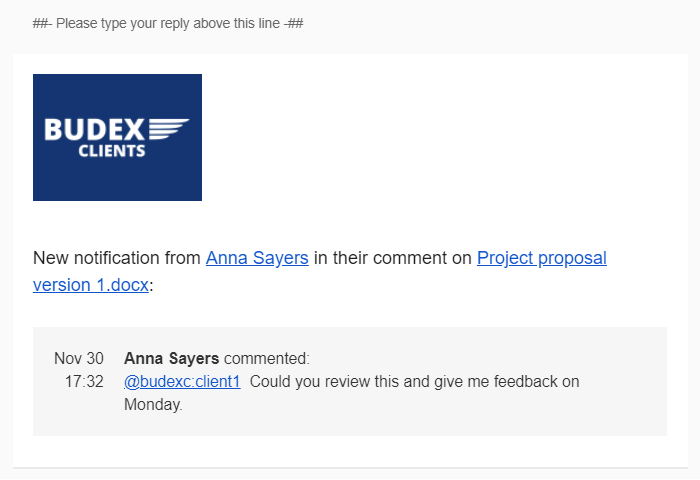 When you post the comment, it will send an email notification to every member of that group. 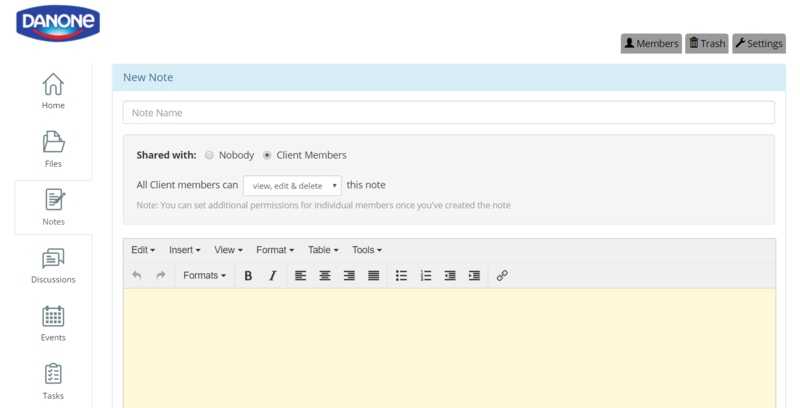 The third and final method of sending emails to all members of a group that I will be showing you is via file upload. This way is particularly ideal for distributing newsletters, catalogues etc. 1. Open the files section of your group and upload a file as usual by selecting Upload Files, choosing your file and clicking Upload. 2. You will then see a notification at the top of your page saying You have uploaded a new file, with the option to Notify others. 3. Select Notify others, it will then come up with a message saying that you have uploaded a file, with a link to the file. You can change the message if you like, then select Share and all group members will receive the message through email. If you would like to email your group a file that has already been uploaded to your portal at a previous time, then you can also do this by using the comments. 1. Open the file that you wish to share with your group. 2. In the comments, type the @ symbol, followed by the name of your group and select it from the drop-down menu. 4. Type the message would like send them and select Post comment, all members of that group will then be notified via email with your message and a link to the file. These are all methods of sending emails to an entire group at a time from your portal, eliminating the need to use email and saving you loads of time. Using the recent activity method is most useful for sharing quick, urgent alerts. Whereas sending group notes is great for sharing longer messages containing media that needs formatting, and sending emails via file upload is ideal for sharing PDF’s such as newsletters or catalogues.